Stampin' With Sarah: Did you say no red, pink or white? Are you out of your mind? Did you say no red, pink or white? Are you out of your mind? Hi all, happy Sunday! I am having a bit of a reprieve, Elias is napping and John took Reid to the movies. Big Sigh! 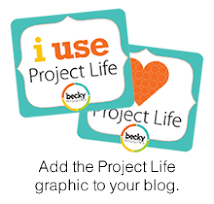 One of the blogging groups I belong to (Hi Ladies!) issued a challenge (thanks LaToya) We had to create a Valentine's card without using pink, red or white. I promise I used Very Vanilla! I actually struggled but it was fun to think outside my box. The base is Kraft and is layered with Chocolate Chip and designer paper from 7gypsies. The Hero Arts owls are stamped in Earth Elements and the bling is from SU. I am trying to make my resolution to lose weight stick. I had a little set back while my Mom was here, but I am ready to continue on it. My big question is Weight Watchers or on my own? Thoughts? Enjoy and thanks for stopping by. Sarah this is great!! You did super on the challenge!! I do weight watchers...lost 28.4 lbs so far...joined in May last yr. I have about 30 to go!! If you need advice or a buddy let me know!! Hey Sarah - I just love the way you conquered LaToya's challenge. Your card looks great. I really enjoy owls and adore this one. Great colors. My husband and I have been eating a low carb diet and so far I have lost 15 pounds since July - I really thought I would miss the bread and potatoes, but have been very surprised with the fact that I haven't. I have a friend who is in WW and she is doing great. Good luck with making your choice and we'll be here with you every step of the way !! Love your card Sarah! You did a great job with the challenge! Good luck on your weight loss! I really need to get myself motivated to do this (again!) too. GREAT job on the challenge. 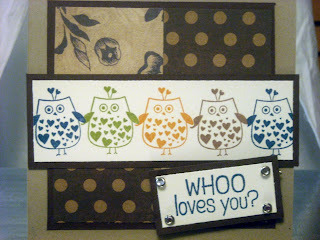 Love your owl card :) I'm doing WW but on my own. I have the points slider and figure it all out. I keep a notebook and write everything down, it really helps! I just started back so I'll see how my first week went on Wednesday. I'll be posting my results on my blog so if you want to have a buddy, follow me on mine and I'll be looking after yours too. Good luck! Hi Sarah! Love your card for the challenge! Love those owls! I just met my Lifetime with WW. I really love WW. It is hard but really works! Good luck with whatever you chose! OMG - this is just darling! Owls are one of my most recent obsessions. You've done a fabulous job on this challenge!! I'm on a low cholesterol diet these days. I've always been someone who could eat what they wanted without gaining any weight. But I turn 50 this year, and my metabolism has completely fallen apart. My cholesterol was way up at my last yearly exam, so I decided it was time I do something about it before it's too late. Haven't really lost anything yet (it's only been a few weeks), but I do feel better. Exercise is my next hurdle to tackle. Awesome!!! This is a difficult challenge, but great for all of those out there that don't like traditional colours. I love your card! Wonderful card for the challenge. Aren't those owls cute? And you did a wonderful card for the challenge. See, now that wasn't hard, was it(wink)? good luck with the resolution. i have a gf who has done it this past year and she is 10 lbs away from lifetime. her husband is doing the program with her and she says that has made the difference! Sarah, this is a great card. The multi-colored owls are so fun! Its a great answer to LaToya's challeng. :) Good luck on the weight loss resolution. I've known multiple people who swear by WW but I had a hard time when I tried the points program on my own. I've found the most success in the past when I kept a food journal and really tried to stick to a certain calorie limit (that wasn't too restrictive but enough for weight loss).